In Prince George’s County, Maryland, Kiddie Court helps prepare children as young as 2 to testify in court. Children spend hours at the courthouse getting familiar with the courtroom, the players and the process with role playing and a mock trial. It was modeled after a program in Maricopa County, Arizona, and is the only program like it in Maryland, advocates said. Many cases of domestic violence play out in the home, too often in front of children, and in those cases, their testimony can be critical evidence, but that can be daunting for a child. “We have cases coming up where we have teenagers who have witnessed their stepfather actually killing their mother right in front of them, and those girls are going to have to testify,” said Donine Carrington, chief of the Special Victims and Family Violence Unit at the Prince George's County state’s attorney’s office. Young domestic violence witnesses could be asked to take the stand against a loved one, and they may also be traumatized by what they witnessed. In Prince George’s County, Maryland, Community Advocates for Family and Youth (CAFY) operate Kiddie Court in English and Spanish to help prepare children as young as 2 years old to testify. Each year, 100 children participate, spending hours at the courthouse in Upper Marlboro getting familiar with the courtroom, the players and the process through role playing and a mock trial. “So they sit as a prosecutor, they sit as a defense attorney, they sit as a juror, and as you can imagine their favorite is to sit as a judge,” Carrington said. The goal is to ease the fear and pressure and to build courage. “They are gaining the confidence so they can actually come in to court and say this is what I saw this person do,” Carrington said. 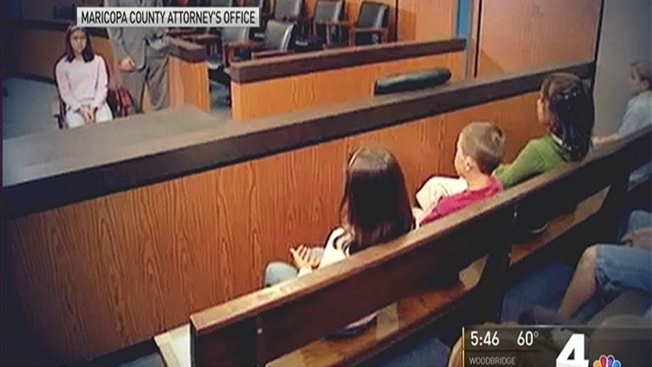 Parents can ask the prosecutor questions about what to expect as the trial approaches. “They need to understand the dynamics of how their child is feeling, that maybe there will be some acting out as it gets closer to the trial date, and also, tips on what can I do to kind of comfort them,” CAFY Executive Director Arleen Joell said. The Foundation for the Improvement of Justice recently recognized Kiddie Court for its role ensuring survivors and victims have a voice in the process.